In general, crows love the ways that humans transform the environment. We plow down forests and replace them with suburbia, creating a perfect mix of the occasional nesting tree and plenty of grassy yards perfect for looking for bugs. On top of that, we litter and waste food, providing lots of additional foraging opportunities outside of our yards. And even when we replace the forests with urban epicenters, we build towers perfect for nesting, leave out even more garbage, and make the environment less hospitable to predators. But this climate change thing, well now we’ve gone too far. Even for crows. Scientists know that climate change is going to be bad for lots of species, with some projections estimating that by 2050, 15-37% of species in the areas sampled will be committed to extinction if current emission trends continue1. Not all creatures will be worse off as the climate warms, however, some will do quite well. Who are these lucky creatures you ask? No, not beautiful sword-billed hummingbirds, or rare pygmy marmosets but…mosquitoes. GO is a proud (albeit perhaps oblivious) participant in the #iamclimatechange campaign. Warmer, and in some places wetter, climates are projected to not only increase mosquito numbers but, importantly, increase the incidence rate of West Nile virus2. Crows are particularly susceptible to WNV over other non-corvids, making this especially bad news for them3. One study showed that some regional crow populations across the US declined 45% since WNV was first introduced in 19994. As warmer temperatures march north, scientists predict we’ll see WNV not only increasing in areas where is exists now, but spreading to northern latitudes where it may have a particularly acute effects2 (I’m talking to you, Canada!). By extension, this is also bad news for us, since humans can also get sick from being bitten by infected mosquitoes (there is no evidence we can be infected from handling sick or dead crows, however5). Not to mention all the other diseases mosquitoes carry that kill people and birds. 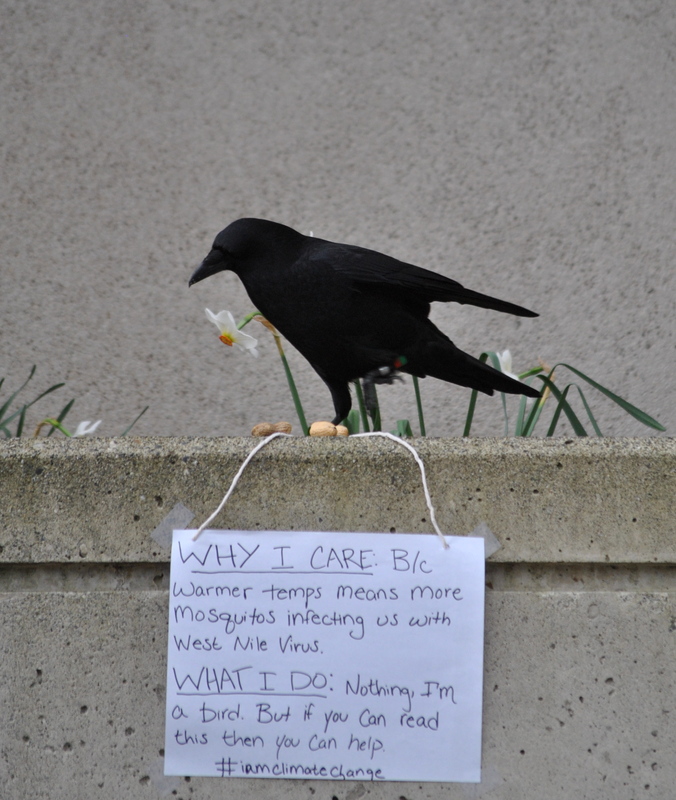 So whether you care about climate change because you care about crows, humans, or any of the other organisms that are/will be negatively affected, now is the time to do something about it. Individuals can have profound effects by making changes in their own lives, and by putting social pressure on others to do the same. There’s plenty of reason to be hopeful if we act! To learn more about the #iamclimatechange campaign that GO was nice enough to participate in please check out the tumblr or facebook page. 3. Yaremych, S. A., Warner, R.E., Mankin, P.C., Brawn J.D., Raim, A., & Novak, R. (2004) West Nile virus and high death rates in American crows. Emerging Infectious Diseases, 10, 709.